1. Illinois became a state in 1818 (with Shadrack Bond as its first governor and Pierre Menard as its lieutenant governor). Northern Illinois was an untrodden wilderness. In 1812 maybe a dozen settlers resided around the site of Chicago, hovering within the protective shadow of old Fort Dearborn. Population in the area did not advance beyond the main watercourses. In fact, several Illinois counties had no settlers within their boundaries as late as 1840. 2. Kaskaskia was the first state capitol in 1818. In its time, as many as 7,000 residents lived and worked on the island. The first territorial legislature in session on the island established a law enabling the people to form a state government. In April, the legislature passed many laws setting the boundaries and establishing methods to pay for roads and canals. A provision of the law stated that “the section numbered 16 of every township, and when such section has been sold, shall be granted to the State for the use of the inhabitants of such townships for the use of schools.” The Constitution of 1818 had no word with regard to education, and there was no attempt made at the time to organize any system of public education. 3. Private enterprises applied to the state for charters to provide education. Madison Academy at Edwardsville, Belleville Academy at Belleville (St. Clair County), and Washington Academy in Carlyle were subscription academies for the education of youth. Provisions were made in their charters for the instruction of females and to cause poor children to be educated as soon as financial conditions made it possible. 4. Illinois approved an act providing for the establishment of free schools in January of 1825. The law contained all of the conditions necessary to make it a free-school law. It provided for a school system covering the entire state. It changed the old system of rates and supplied whatever revenue was needed beyond the income from the school funds from a general tax levied upon realty and personal property and also upon persons. Few schools sprang up during the next 30 years. Another attempt at creating a comprehensive school law was passed in 1841. 5. A bill to create the office of county superintendent was introduced into the legislature in 1839. It was defeated, however, as was a bill for the creation of the office of state superintendent. 6. In 1845 the law provided for an ex officio state superintendent of common schools and for the election in every Illinois county of a school commissioner who shall be ex officio superintendent of common schools in his county. His duties included the examination of persons desiring to teach in a common school and the granting of teaching certificates to those found competent. Teachers had to be certified for their schools to receive public funds. Textbooks must be in the English language, which had to be the common language in the schools. Trustees were authorized to purchase school libraries and real estate for schoolhouses. 7. In 1853, the State Teachers’ Institute, the forerunner of the State Teachers’ Association, was organized. This organization was instrumental in the establishment of the state normal (teacher) schools. 8. In 1855, the legislature passed the bill authorizing the separation of the office of Superintendent of Public Instruction from that of the Secretary of State. The new officer, who was Ninian W. Edwards, was directed to report to the next legislature a bill that should provide for the education of all the children of the state. Ninian W., son of Ninian Edwards, who was territorial governor for 9 years and Governor of Illinois in 1826, grew up on Kaskaskia Island and later married the sister of Mary Todd Lincoln. 9. In 1865, the law was amended to create the office of county superintendent of schools, with a tenure of four years, and to require such officer to visit each of the schools in his county at least once every year. For such a service he was allowed $3 a day. Problems arose in that this amount of compensation created a financial loss for the superintendents, so in 1867 compensation rose to $5 per day. Requirements for county superintendents: superintendents are elected by popular vote for four-year terms. Any citizen possessing the ordinary qualifications of an elector may hold the office. They must take an oath and give bond and are liable to removal. They may sell school lands under certain conditions. They have the custody of all county school funds; they are required to visit each of the schools in their respective counties at least once each year; they are the official advisers and assistants of all of the subordinate school officers and teachers of their counties, and are the agents of the State Superintendent in reaching schools. They are enjoined to encourage the formation and assist in the management of teachers’ institutes. They have primary jurisdiction in questions and controversies arising under the school law in districts and townships, and their decisions are final unless appeal is taken to the State Superintendent. They are the only authority that can examine and license teachers except the State Superintendent. Their compensation is $5 per day for services actually rendered and it is payable semi-annually from the county treasury. They also receive a three per cent fee for the sale of school land and a two per cent fee for all moneys distributed, paid, or loaned out. They are required to report annually to the State Superintendent. The closer supervision of the schools that led to the development of the present course of study had its beginning in Macon County about 1879 with John Trainer, County Superintendent of Schools in that county. His work soon spread into Piatt and Champaign counties and grew into what served for a time as a course of study for those counties. At a meeting of the Central Illinois Teachers’ Association at Jacksonville in March of 1889, a committee consisting of county superintendents from Champaign, McLean, Knox, and Vermillion counties was appointed to create a course of study for elementary students. The course covered grades 1 through 8 and was for eight months during the year. The course was completed and published in time for the opening of school in September of that year. The edition was published by the State Department of Education. It was used in most of the counties of Illinois and in counties throughout the country from New Jersey to the West coast. The course of study was revised at least 4 times between 1879 and 1907. In 1907 the course was revised to include foreign language, 2- or 3-year high schools, and vocational schools. At the regular biennial session of the Fiftieth General Assembly in 1917, legislation was passed to provide funding for all students in the state to attend high school. House Bill No. 709, which was approved on June 22, amended An Act to Establish and Maintain a System of Free Schools, which was approved and placed in force on June 12, 1909. The Act outlined the procedures necessary to create and sustain high school districts. It created five elected-member boards of education to set policy and help administer high schools. The Act also gave the board the power to establish the location of a community high school at some central point most convenient to a majority of the pupils. As ex officio board composed of the county superintendent of schools, the county judge, and county clerk were given the discretion to change the boundaries of any township or community high school district. In order to change the boundaries this board would accept a petition containing the wishes of two-thirds of the legal voters residing within the territory described in the petition. The Act gave the board the power to combine parts of districts into new school districts or add area to existing districts. 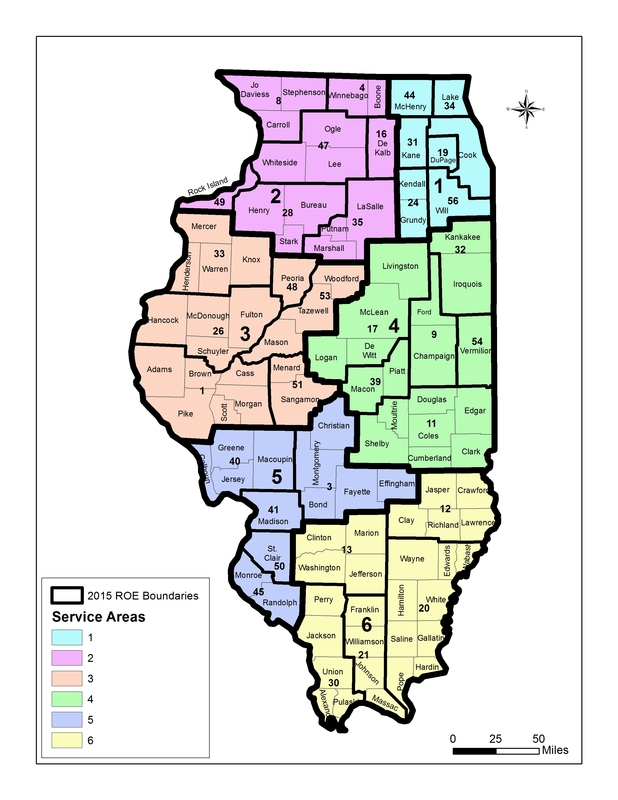 If the districts involved in the change of boundaries were physically in two or more counties, the change was made by concurrent action of all the ex officio boards of the counties. The state superintendent of public instruction was the avenue of appeal for disgruntled citizens. The superintendent had the authority to order a change in boundaries of all abnormal high school districts with a view of making each high school district consist of compact and contiguous territory. The 1917 Act required that all properties not included in a township high school district, community high school district, or a district maintaining a recognized four-year high school be organized into a non-high school district for the purposes of levying a tax to pay the tuition of all eighth grade graduates residing in the non-high district. Tuition dollars were paid to recognized two-year, three-year, or four-year high schools. The amount was based upon the per capita cost to educate a child in the receiving district. The county superintendent of schools was designated an ex officio member of the non-high board, which consisted of three elected members of the community. These board members set policy and levied taxes for the non-high school district. On June 27, 1951, legislation was approved to change the landscape of Illinois school districts. 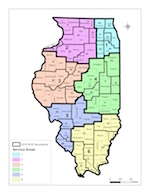 Senate Bill 363 of the 67th General Assembly mandated that all the territory of the non-high school district of any county be annexed to some high school district in the area by June 30, 1953 (IL Legislative Bureau, 1951). If there were non-high territories existing after this date, it became the county superintendent of school’s responsibility to dissolve the non-high district and to annex any remaining territory to one or more adjacent high school districts. The late 1940’s and early ‘50s were trying times for county superintendents. Decisions had to be made that were not popular. District boundaries were drawn and petitions filed with questions for voters concerning annexations of small districts (one-room schoolhouses) into larger unit districts. 13. 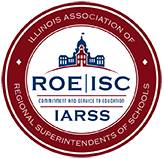 In 1973, the 102 county superintendents in Illinois, who had been in office since 1865, saw their numbers reduced to 78 and became Regional Superintendents. 14. In 1977, further consolidation of smaller counties reduced the number of offices to 57. 15. In 1994, legislation was passed that eliminated the office of the Regional Superintendent in Cook County as of June 30, 1994. Subsequent law allowed for its reinstatement on August 7, 1995. 16. In 1995, the 57 Educational Service Regions were reduced to 45, and the services of the 14 Educational Service Centers were included with the other services offered by these Regional Offices of Education.